E fa’atalofa ma fa’afeiloai atu i le mamalu o le tatou Aufaigaluega ma o outou faletua, fa’apea foi le mamalu o le tatou Pulega i le Northwest i le suafa mamalu ma le maualuga o lo tatou Alii Fa’aola o Iesu Keriso. E fa’apitoa foi se fa’atalofa i lau Susuga Tuugasala ma le faletua ia Julie Fuga, le Ta’ita’i o le Itumalo a Samoa, fa’apea foi sui o le Komiti Fa’afoe ma o outou faletua, Toeaiina o le Fonotele, Toeaiina faufautua, ae maise Toeaiina o Pulega ma o outou faletua. E fa’atalofa atu foi i Auauna a le Atua ma o outou faletua, le paia maualuga o pulega taitasi i Tama ma Tina, le tupulaga o tama ma teine, seia oo i fanau iti, talofa, talofa lava. E momoli atu le fa’afetai ma le fa’amalo i a outou talosaga ma fa’atoga i le Atua. Fa’afetai i lo outou lagolagoina o le fa’aaliga ma le fa’asinoga a le Atua i lenei foi itu o la tatou Itumalo. Ia fa’amanuia atu le Atua. Greetings in the mighty name of Jesus Christ our Lord and Savior! I would like to take this opportunity to greet all of our fellow servants in the Lord here in our Northwest Section. 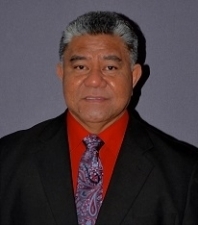 I’d also like to acknowledge our Superintendent of the Samoan District Council (SDC), Pastor Tuugasala and Julie Fuga as well as our SDC Presbytery team and their wives. Furthermore, greetings to our fellow servants in the Lord throughout our various sections in the SDC, and finally, a special greeting to all of our friends and guests who are visiting our site for the first time. Welcome to our website! Thank you for praying, encouraging, and supporting the mission of our Northwest Samoan Section. Please let us know how we can better serve you. Our prayer is that this site will be used as a resource to help further the kingdom of God by fulfilling His great commission. May the LORD bless us as we continue to fulfill His calling on our lives!